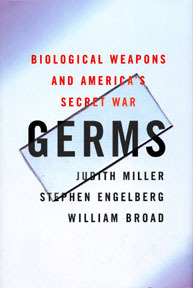 With the attack on the World Trade Center and the mailing of anthrax spores that occurred this fall, no book could be more timely than GERM. Written by three vereran reporters for the New York Times, the book sketches the outline of the U.S. bioweapons program in the first 65 pages, then zeros in on its true subject, the Russian bioweapons program. The description of the U.S. weapons program is certainly sketchy — it devotes one senetnce to our extensive and apparantly successful program to weaponize anthrax, and makes no mention of the testing of these lethal bioweapons in the Pacific in the early 1960s. The treatment of the soviet bioweapons program is far more extensive. While they add little to what is said in BIOHAZARD (written by defector Kanatjan Alibekov, former chief scientist of the Russian bioweapons program), the reporters succeed in scaring the pants off me by their effective presentation of what is, after all, very scarey stuff. The real threat, as they clearly see, is not from Russia, but from small groups like Osama bin Ladens cells and the Aum Shinrikyo group (the terrorists that attacked the Toyko subway with Sarin nerve gas). Bioweapons are cheap and while they require some expertise to develop and deliver, an attack is not beyond possibility. No one knows if the Rusian smallpox bioweapon has found its way into the wrong hands, or if weaponized anthrax has. But we ought to act as if the threat is real. I suspect it is. Hope not.